Pickets start at 6AM and 6:30AM, with 1PM action to target company of CICS co-founder for insider dealing that has given company control of over half of stockpiled $36 million in public funds. 6:00 AM: CICS – Northtown HS. 3900 W. Peterson Ave.
6:00 AM: CICS – Wrightwood, K-8, 8130 S. California Ave.
6:30 AM: CICS – ChicagoQuest North HS, 1443 N. Ogden Ave.
6:30 AM: CICS – Ralph Ellison HS, 1817 W. 80th St.
At 1PM Wednesday, striking CTU educators will hold a press conference and picket at the headquarters of CW Henderson, owned by CICS co-founder Craig Henderson, who also served as president and treasurer of the charter operator. Henderson cut a deal with CICS management to ‘invest’ more than half of the $36 million in public funds the operator has been hoarding in what educators have characterized as an appalling conflict of interest that CICS failed to disclose in investment documents. “The municipal bond market is clamoring for more charter school bonds,” Henderson said to Crains in 2014, before his CICS associates cut the deal to ‘invest’ pilfered public education dollars with his company. average classroom. CICS has also proposed RAISING the ratio of students to social workers and counselors by more than 200% over recommended levels—a move that would allow them to cut these positions. CICS also wants the capacity to cut student programs, and has offered paraprofessionals a ‘raise’ that barely keeps pace with inflation. 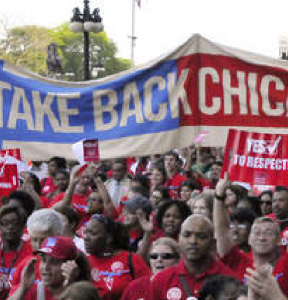 To add insult to injury, CICS has failed to send ‘deciders’ to the bargaining table for the last two days, instead sending low-level bureaucrats who have no power to cut a deal without the authorization of top executives. 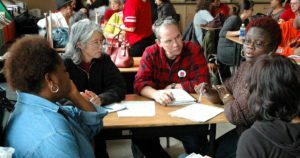 Low wages and poor working conditions drive huge turnover at CICS schools, and has forced paraprofessionals to staff some classes instead of subject-trained teachers—at much lower wages. 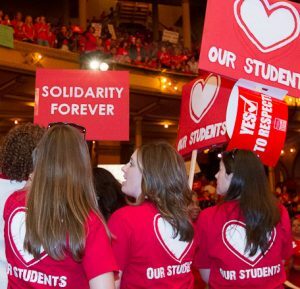 According to CTU calculations, management would have to allocate just a fraction of the $36 million they’ve siphoned away from schools to save the jobs of counselors and social workers, provide equal pay with CPS educators, cut class sizes, and end the harm that high staff turn-over has on students.